It’s Monday. You’re tired. The thought of putting together a dinner menu sounds like a recipe for the afternoon doldrums. 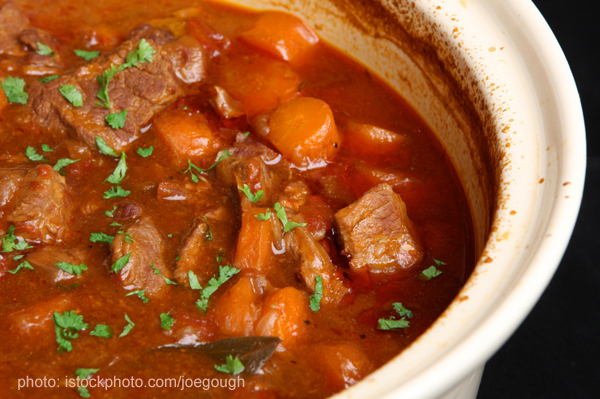 Take the time and worry out of dinner making by throwing together a pot of this tasy, Crockpot Beef Stew. It’s simple, delicious, and perfect for hectic autumn evenings. This recipe can be cooked two ways. There’s the slow cooking version, where you toss together, set your crockpot on low, and let it sit for 6-8 hours. If you’re heading out the door to work, this is an ideal way to prepare a tendy, savory beef stew. If, however, it’s noon and you are just now thinking about what you should make for dinner, it’s not too late to use the crockpot. You’ll still need 3-4 hours of cooking time, but set your slow cooker on high to speed up the process. The meat may not be quite as tender as it would be with the 8 hour slow cook, but your family is still sure to love this meal. Place all of the vegetables in the slow cooker. Add the tomato sauce and mushroom soup. Sprinkle gravy mixes and ranch dressing mix over the vegetables, then stir it all together, making sure the meat and veggies are evenly coated. Add just enough water to cover the meat and veggies. Cover and cook on low for 6-8 hours, or on high for 3-4 hours. Serve with a loaf of warm french bread.